Last year I wrote of my hopes for an eggy future with the imminent arrival of chickens. What a difference a year (and a bit) makes. Since then the flock’s population has risen from five to twenty five (today’s tally) and I can’t imagine what life was like without them. The first thing I look for nowadays in a recipe is how many eggs are called for. Although the number of eggs collected each day fluctuates, it is still an ongoing challenge to use them up. When I can, I make a concerted effort to blitz the egg mountain and a rare glimpse of the bottom of the egg bowl is a victorious sight. Now when I bake I sometimes add an extra egg just for the heck of it, just cos I can, just cos another one bites the dust. The yolks are a glorious orange that enriches and colours anything they are added to. 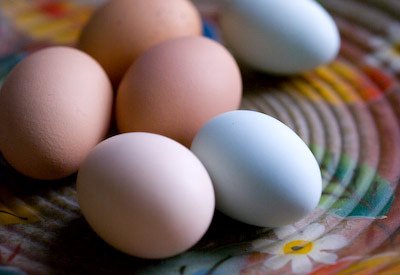 For baking they come into their own, but eggs aren’t so useful for preserving. 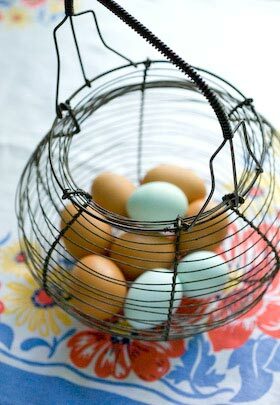 I do pickle batches of petit bantam eggs as my neighbours like them and it takes care of a nice clutch, a dozen, or more eggs in one fell swoop. Fruit curds are considered to be preserves even though they generally keep for a much shorter time than jam does. Making them also uses up eggs. Curds keep for anything from a few weeks to a few months if stored unopened in the fridge and they can be frozen if you wish to keep them for 6 months or so. Once opened you should use them up within a week or two. I prefer to preserve fruit puree, which can be bottled and stored on the pantry shelf or frozen. Then the fruit is ready and waiting for making small batches of curd just when it is needed. Curd is delicious though, so well worth making. Imbued with fruity custardy loveliness, it’s just perfect for sandwiching a sponge cake, dolloping on meringues or filling a pastry case. 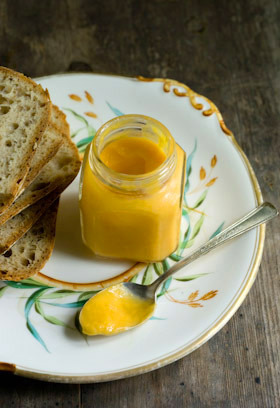 I’ve been eating apricot curd slathered on sourdough bread and it’s delicious. No need for any butter between as the curd has a fair amount of that included already. In the same way as making custard, fruit curd needs to be constantly stirred in a bowl set over simmering water, to cook it through gradually, as a too high direct heat will result in a horrible curdled mess. As you stir, the ingredients emulsify and the mixture becomes smooth and thickens. As it cools in the jars, it will thicken a bit more. Luscious. Stone and quarter the apricots. There is no need to peel them. 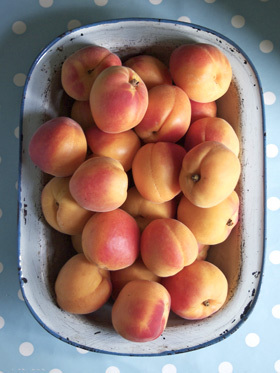 Place in a pan with 2Tbsp water and simmer gently for around 10 minutes until the fruit is soft. Leave to cool then push through a sieve or use a food mill to make a smooth puree. It should make approx. 300g (10 oz) of puree. Place the puree in a bowl set over a pan of simmering water, add the eggs straining them through a sieve, then add all the remaining ingredients. Cook gently stirring continuously with a wooden spoon until everything is combined and the mixture thickens enough to coat the back of the spoon. This should take about 30 minutes to achieve. Pour the curd into small hot sterilised jars, covering the surface of each with a waxed paper circle, then seal and leave till cold. Refrigerate until needed.